Just Dogs PlayCare is dedicated to giving dogs a terrific socialization experience. With services that range from daycare to obedience and a new facility, Just Dogs PlayCare was ready to refresh its brand. 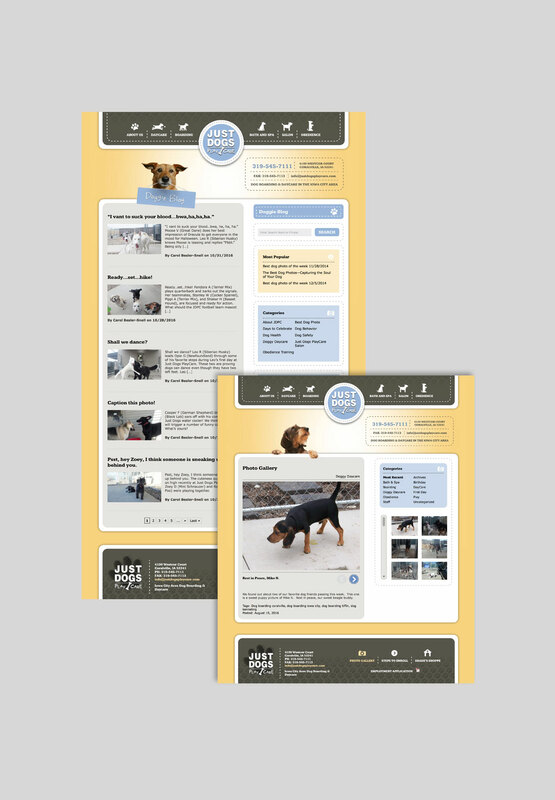 The focus of this refresh was to create an online presence that could better highlight their services and visually show the dogs’ experiences. With print and social media as an important components, Creative Mellen helped Just Dogs PlayCare create a brand to fulfill all these goals. With Just Dogs PlayCare, we determined an important goal of the brand refresh was to communicate the fun, playful nature of the dogs’ socialization activities. It’s this specific attribute that sets Just Dogs PlayCare apart from its competition. Building off their current brand colors, we created a new design that incorporates playful icons and imagery to set this brand apart. Intake interviews and personalized service is a focus at Just Dogs PlayCare. In-person inquires led us to develop an overview brochure, posters, and price sheets. We designed the website to be fun and match images of the dogs’ experiences. The imagery was playfully used to interact with design elements, further illustrating the spirited nature of the company while leading audiences to the information they need. We developed two important site components: to show the dogs’ experiences and to educate owners on the different aspects of taking care of your best friend. These two components include a fully editable photo gallery and blog. Both features allow for social media-driven updates and robust SEO content.